Game of Thrones Review: "Hardhome"
Shane Ryan and Josh Jackson review Game of Thrones each week in a series of letters. F***ing spectacular. Let’s start there. Game of Thrones has had some great battle scenes, from King’s Landing to The Wall, but this was the greatest. It fulfilled the promise of the very first episode, when we saw what the White Walkers could do, and it projected that hint of terror on an overwhelming scale. 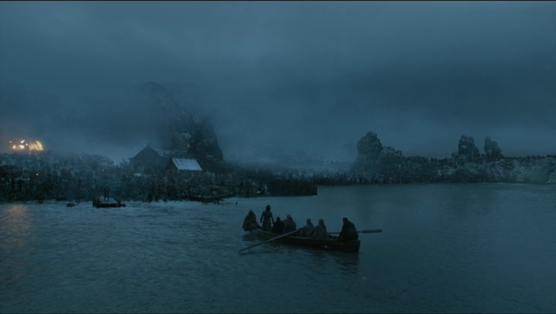 When we talk about this show years from now, one of the first thing we’ll remember is the image that closed last night’s episode: The White Walker standing on the docks, with his hands outstretched, staring across the water at Jon Snow and raising the dead. It was a monumental show of force, and it’s the first time we’ve really seen the scope of what Westeros will face when winter comes. When GoT is really, really good, these are the kind of resonant tableaus it produces—the fog, the sound of lapping water, and the two men staring across the short expanse as the blue-eyed revenants come to their feet. Even the music as the credits rolled, that haunting theremin-esque strain, brings us back to the opening scene of the first episode—we’ve circled back to the beginning, but our naiveté is gone. Simply put, it’s the most powerful, impressive scene Game of Thrones has ever produced. I’m staggered. This is what great television looks like. This is how it feels. I almost don’t know where to go from here. The magnificent spectacle of that battle will deservedly overshadow the rest of the episode, but “Hardhome” was nearly perfect from beginning to end. For starters, Tyrion and Daenerys are the incredible pair we imagined, and then some. Here, I think, is the first really major piece of plot that George R.R. Martin’s books haven’t reached, and as we watched the two of them verbally spar, I couldn’t help but wonder how he felt as a critical part of his story reached a wide audience before he could tell it on his own terms. But I’m not going to spend too much time dwelling on that—that’s the price of taking his time, and at least for me, it won’t devalue his future books, when or if they come, in the least. The important thing here is that we’ve been waiting for these two to meet in both universes for a very long time, and it more than lived up to its billing. Particularly for Tyrion, this was a tour de force. He was up against the wall, figuratively and almost literally, and he had to produce more than his usual share of brilliance simply to keep his life. He pulled out all the stops—he was funny (“I am the greatest Lannister killer of our time”), he was audacious (“Into your service? Your grace, we have only just met. It’s too soon to know if you deserve my service.”), he was flattering (Daenerys has an ego, and he played to it perfectly by retelling her rise to power from his perspective), and he proved his own value immediately with sage advice about Jorah. Watching Tyrion maneuver out of danger when he has absolutely no bargaining power has always been one of the real joys of this show, and this was no exception. From the subtlest gestures—the way he slowly submits to Daenerys without ever seeming to say a submissive word, thereby keeping her respect—to the way he approaches her on the stairs, it’s a master class in gaining immediate influence. She can’t argue with his analysis of Jorah’s position, and so, facing banishment or beheading, he instead becomes indispensable in a matter of minutes. In terms of pure survival instincts, it might be his finest hour. Credit goes to Daenerys as well for recognizing how valuable Tyrion can be. Is it me, Josh, or did the mother of dragons seem immediately more substantial than she’s been in two seasons by playing off Tyrion? I care about Daenerys again—they won me back in the space of a single episode. Her quest to capture Westeros, to “break the wheel,” has a striking significance that it lacked only last week. It feels like Khaleesi just ended a stifling siege with a thunder stroke, and now she’s free to wield her awesome power. And there’s depth, too—she’s still ambitious and ruthless, but she recognizes the danger in becoming like her father, and she can forgive enemies like Tyrion, and she can even recognize the danger in his minor weaknesses, like his fondness for wine. And her thinking is subtle—Tyrion praises two men, Varys and Jaime, who look like enemies to her on the face of things. There’s still a part of him that bridles at his honesty, but when that storm passes, she knows it’s the quality that makes him most valuable, and it’s the thing that convinces her to let him live. I could analyze those two sequences ad nauseam, Josh, because they were both so intelligently wrought. Instead, I’ll move on to Jon Snow, who has become the greatest and most forward-thinking leader in Westeros, even though he only rules a small band of men who have been rejected by the rest of the seven kingdoms. Incorporating the Wildlings is a stroke of genius, and you can tell how smart it is by the fact that neither side can stomach the idea. But when a group of about five White Walkers can oversee an attack of Wights that overruns a Wildling encampment with relative ease, and the losses only add to their army, it’s clear that there are certain enemies who better become friends, and fast. I’ll leave it there for now and kick it your way—what did you think? I agree completely that this was one of the best episodes the show has given us so far. The Battle of Blackwater stands among my favorite, but this left me breathless. From the moment we watched the mother say goodbye to her girls, we new something bad was coming. But the swarms of the corpses may have just made The Walking Dead my second favorite zombie TV show. The giant stomping on bones. Jon Snow realizing Valyrian steel won’t shatter. The creepy child wights. And that final stare across the water. All beautifully shot and well-scripted. I’m thankful that it was given the space to be fully realized. And yes, Tyrion and Daenerys! His razor-wit has been enjoyable when he’s surrounded by fools, but that’s not needed here and he can apparently do earnest wisdom as much as he can do detached self-amusement. It’s hard to believe he was trying to drink himself to death a few weeks ago. His best line of the night may have been the simple confession that he’d given up on life until Varys convinced him the Mother of Dragons might be worth living for. If she were to have him killed, that would have removed his final reason for breathing anyway. We got the first new face from Arya, the orphan-turned-oyster-merchant. Her first target is a ruthless money-lender, and she takes to the task at hand. Arya the Assassin. And poor Sansa got the first bit of good news in a long while: her brothers are alive. But really, this was the Jon Snow show. Kit Harington has done a superb job portraying the honorable but unsure boy who became a true leader of men. He’s been a joy to watch. So we’ve talked before about how the show is often at its best when the fantasy elements take a back-seat to the more universally human ones, but this was an exception to that rule. This was as fantastical as they come with White Walkers and their army of the undead, plus giants and magic dragon glass fallen soldiers getting reanimated. But it worked. What’s the show’s secret for bringing fantasy to a broader audience? I can only speak for myself as someone who doesn’t really “do” fantasy aside from GoT and LotR, but what works for me is how closely it seems connected with a historical reality. We all know that most George R.R. Martin plot points have an anchor somewhere in an actual history—usually medieval—but even when dragons or re-animated corpses are introduced into the action, it still feels somehow real. So, yes, we just watched a bunch of skeletons fight, and then come back to life after they were defeated, but I still left feeling like I just saw a really great human battle sequence. In the end, the wights are weapons of war, and they’re necessary, because in ways that men like Jon Snow are just beginning to discover, the White Walkers are vulnerable. You mentioned Jon with his Valyrian steel sword, and I thought that was a hugely significant moment—once you can fight them on their own terms, they’re only as good as any other man, and Jon was quicker and better than the White Walker, and destroyed him almost instantly. Even though the battle of Hardhome was a rout, and the losers barely managed to beat a retreat, it also taught them how they might eventually win. Now they have weapons too, in Valyrian steel (all too rare) and obsidian (easier to come by). And of course, far away, there are three dragons who may have a part to play. So yes, the fantastical elements exist, but it never feels too divorced from truth, and as such I barely notice. You mentioned Arya—the strength of this episode is best shown by the fact that we skipped right over a major plot point. She’s about to go on her first hunt as a trained assassin! The crooked life insurance salesman will come to regret his weakness for oysters, and Arya will offer the faceless god an involuntary sacrifice for the first time. Here again, we’re on the verge of flying by Martin’s books, and at this point I think I’m mostly excited to see how Arya enters the Westerosi fray again—although unlike Tyrion’s boring journey to Meereen, I’m probably up for watching an extended training montage where she hones her craft on the baddies of Braavos. Then there’s Cersei, whose arc was fairly static this week, but who seems to be getting closer and closer to a confession. By the way, can we take a moment to note what an ineffectual king Tommen has become? I’m not saying I miss Joffrey, but come on, dude, your wife and mother are both in jail and all you can do is stay in your room and refuse food? It’s becoming clearer and clearer that Tywin and Tyrion were the only two Lannisters worth a damn, and the fact that the elder lion hated his dwarf son basically doomed that house to irrelevance—at least until Daenerys restores the Targaryen dynasty and Tyrion takes over Casterly Rock. In any case, I’m having a great time watching Cersei’s fragile state, and again it occurred to me last night how underrated Lena Headley has been for the entire series. She completely embodies Cersei, in all her ruthless, short-sighted fury, and every time she comes on screen, I feel like I’m watching a terrifying display of what happens when mental illness meets power. She’s great. And speaking of actors, you’re dead right that Kit Harington has been unbelievable. Do you remember the old days, back in season one, when we wondered if he was up to the task of playing a character as awesome as Jon Snow? That concern has really flown by the wayside, hasn’t it? From the semi-petulant, vaguely annoying sulk artist of Winterfell, he’s grown into a a compelling leader and commander, and he deserves a massive tip of the cap. It’s one of the most important roles in the whole story, and it requires a serious transformation—I can’t think of another character who changes so much, so fast. He pulled it off with ease, and the show is so much better for it. I know you’re in New York this week, so we’ll end the exchange here, but it’s worth reiterating: After three episodes of build-up, we just watched one of the most jaw-dropping pay-offs in TV history. HBO could spend the next two episodes showing Ramsay Bolton skinning puppies for 120 minutes, and I’d still say this was a great season. “Hardhome” was an all-timer—an absolute gem. Follow Shane Ryan and Josh Jackson on Twitter.